A photo of a shelter dog named Gregory on his "freedom ride" has gone viral. 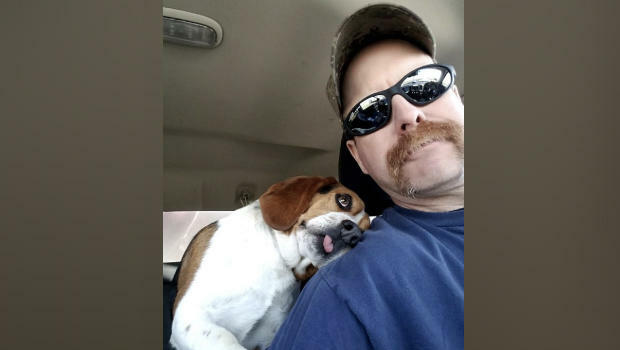 Gregory was scheduled to be euthanized at the Franklin County Dog Shelter in Ohio, when his new pal Joe Kirk came to pick him up and bring him to safety. Kirk works at HOUND Rescue and Sanctuary in Ohio, a special place for hound dogs that need homes. When dogs are rescued from shelters, they go on "freedom rides" to places like HOUND Rescue and Sanctuary. These sanctuaries allow dogs to live without threat of euthanasia until they're adopted. Gregory kept hugging Joe on his ride to the sanctuary -- almost as if he knew he was being saved from doggy death row. "The BEST Freedom Ride Picture EVER! Pulled from the Euthanasia List at FCDS today... "Gregory" is one thankful and appreciative Beagle! He KNOWS he is SAFE!" the sanctuary wrote on Facebook, with a photo of Gregory cuddling up to Kirk in the car. Gregory has a heartworm, but once he has been cleared by the vet, he will be available for adoption and will placed in a forever home. One might say the pup now has a new "leash" on life.